There are some potatoes hanging out on the kitchen counter from the Lomo Saltado recipe and wanted to cook something with it since we don’t really have any place to put it. 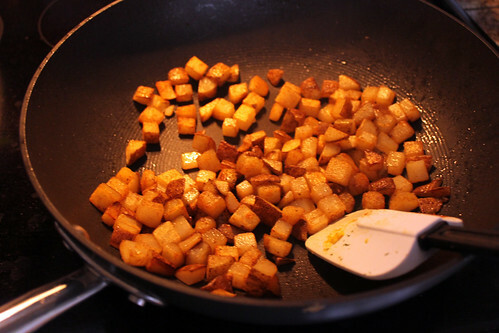 I was browsing through the America’s Test Kitchen Family Cookbook and saw some interesting looking Home Fries in the breakfast section. I wanted to take this recipe up a notch and make a breakfast bowl since I have a bunch of uncooked breakfast food in my fridge. This recipe is inspired by the Meat Lover Skillet from Denny’s. When I used to go to Denny’s a few years back, this was one of the items my buddies and I frequently ordered during one of our many late night visits. This was the perfect dish because everything was cut up into bite-sized pieces and all I had to do was add some ketchup and eat with a fork. Instead of country ham, I used Spam. This dish is flexible. You can use any ingredients you like or have available and it will be dee-licious. Dice potatoes in 1/2 inch cubes and place in a microwave safe bowl and toss potatoes with 1 tablespoon olive oil. Cover and microwave for 6-7 minutes. Halfway through cooking, shake bowl to redistribute the potatoes. 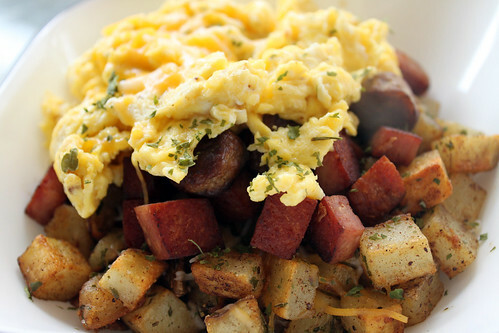 While potatoes are microwaving, dice Spam and sausage to bite-sized pieces and set aside. You can use whatever meats or vegetables you like in this step. Also, crack two eggs in a separate bowl, salt and pepper to taste, and beat the eggs to the count of 80. Melt 1/2 tablespoon unsalted butter in 12-inch skillet/wok on Medium High. Add potatoes and cook until all sides are browned. Once browned, add chili power, salt, pepper, and parsley flakes and toss several times before putting it in a bowl. 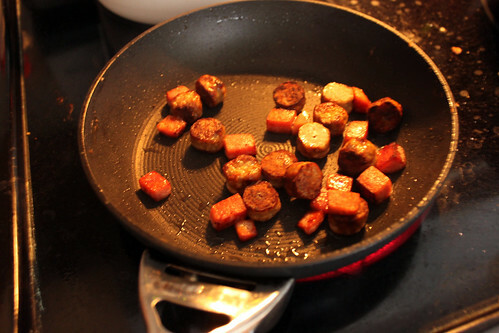 Heat small frying pan to Medium High and cook Spam and Sausage until browned and add to the bowl. In the same frying pan, turn the heat down to Medium and scramble eggs. 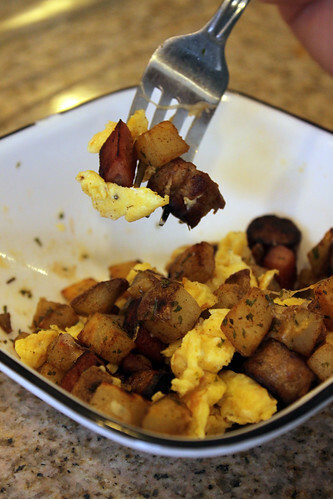 You can add some cheese to the scramble during this step. Add to bowl. 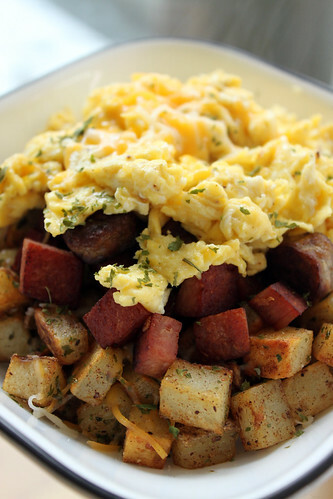 In bowl assemble, potatoes, meat, egg, and cheese and serve immediately.